Knott’s Berry Farm apparently wished to redeem themselves for the disaster that “Curse of the Spiderwoods” suffered from in 2001. Walking into a cave-like setting with an enormous (and we are talking GIANT) spider fall upon you as you enter was an incredible way to kick the maze off. Going deep into the caves of the spiders’ home, you make your way into where humans have been wrapped in webbing awaiting to be the next meal. What was even more interesting was guests actually go INSIDE of the enormous spider! If you suffer from arachnophobia, this maze was NOT for you! 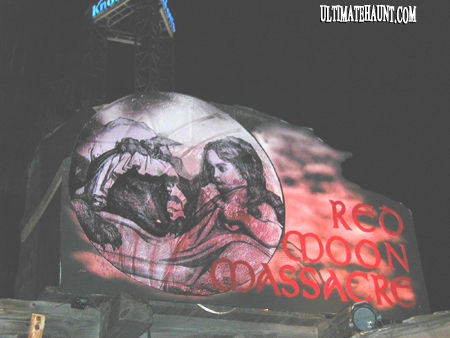 Red Moon Massacre was one our favorite attractions this year. Last year, the attraction was hosted by Elvira, which didn’t fly too well. This year, the hostess was dropped and went straight for the jugular with a ton of killer werewolves. 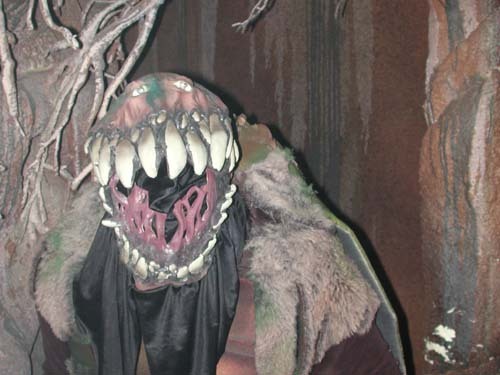 If you have been attending the Haunt for the past several years, you may have noticed that the Log Ride had been suffering from a serious lack of design and talent…not this year though! The werewolves were amazing and theme was as gruesome and gory as any classic Haunt attraction has ever been. A must see, if you’re brave enough!